October | 2012 | ohdenny. Making your own dumplings is pretty simple. I’m the type of person that likes to make things from scratch to see if it tastes any better than those manufactured/processed ingredients. At least once anyway. 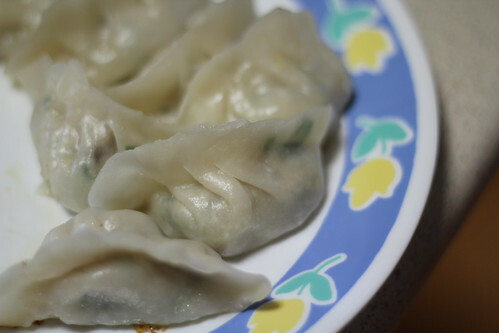 After watching Poh from Poh’s Kitchen/Masterchef Australia Season 1 make dumplings I thought what they hey, let’s do it. We made the dumpling skins, filling and sauce and it wasn’t too much of a challenge! 1. Place flour and wheat starch in a bowl. 2. 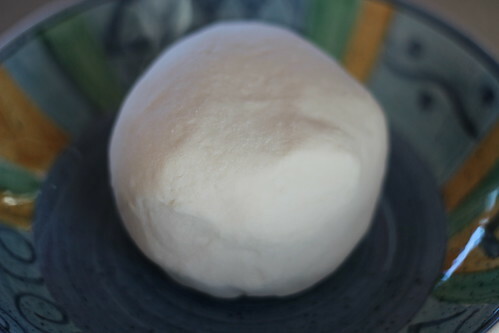 Pour a small amount of hot water into the flour and starch mix and stir with a fork until you can tip it onto the bench top and knead into a firmish, smooth ball. Poh’s recipe doesn’t specify how much water to add, so add maybe a tablespoon at a time because I accidentally added too much and had to re-add the flour and wheat starch to balance everything out. If it feels a little sticky, add a small amount of equal plain flour and wheat starch and mix to the dough. 3. Wrap in cling wrap and rest for an hour. 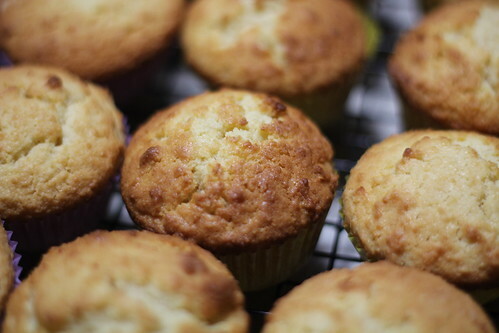 Note: If you don’t have wheat starch the traditional way is to use one cup plain flour but follow the same method. 1. Mix salt with cabbage and allow to sit for 15 minutes so salt can draw liquid out of the cabbage. Wash cabbage briefly before squeezing to remove as much liquid as possible. You should end up with a heaped half cup of cabbage. 2. Mix together with remaining ingredients until everything is incorporated. 3. 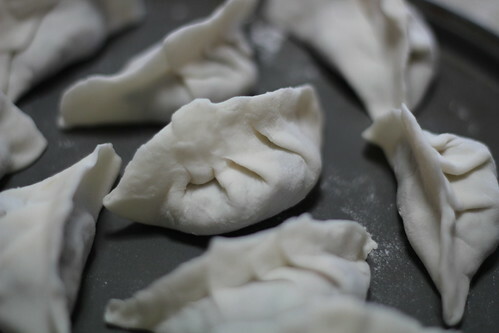 To make dumplings, sprinkle dough with some plain flour and roll into cylinders with a diameter the size of a 20 cent coin. 3. Cut into one centimetre thick disks and flatten with the palm of your hand. Tuck the disks under an overturned plastic container so they stay moist. With a dumpling rolling pin or 20 centimetre piece of dowel, roll ONLY inwards from the outer edge of each circle, so you maintain a regular circle. If you roll outwards, you will find the circle will become misshapen very quickly. 4. Once the dough has been rolled out to about one millimetre thick, spoon a teaspoonful of the filling onto the centre of the wrapper. When crimping, only pleat one side of the dumpling leaving the other edge straight. This will give the dumpling an attractive crescent shape and let it sit nicely. 5. There are two ways you can cook these. Firstly, you can just boil them in plenty of salt water. When they float, allow them to cook for a further ten seconds, then scoop out with a slotted spoon into a colander. 6. If you want a crispy bottomed finish, position the dumplings neatly in a frypan filled with about one centimetre of water and a dash of peanut oil. 7. Cover and allow the dumplings to steam for about eight to ten minutes. When all the water evaporates, the little bit of oil that remains will help crisp up the bottom. Serve immediately with spice dipping sauce. 1. Mix all the ingredients together and serve with dumplings. In brackets I’ve mentioned using minimal soy and more vinegar, I found it was much more reminiscent of the sauces you’d find in any dumpling house. Poh’s recipe uses way too much soy sauce that you can’t even taste the slightly sour/salty Chinkiang vinegar. We also added diced fresh chilli that really gave it a kick. The actual process of making the skins was extremely straight forward, and fun to make so that’s a definite plus! The skin when cooked didn’t have the same bite to it as dumplings at a restaurant. Usually there is this slight chewiness but nonetheless I found the dumplings to be pretty darn good. With the changes I made to the sauce, it just made a good dish to a great dish. Loved the Chinkiang vinegar with chilli. The filling was pretty much what you’d get elsewhere so I’d say that’s a good achievement. What I liked about these dumplings is that it wasn’t drenched in oil. We used minimal oil or only as much as required so it didn’t stick to the pan and they came out well so I was very happy with the end result. I might try a different skin recipe but I’d keep the filling and sauce (with changes) recipe for the next time I make it. 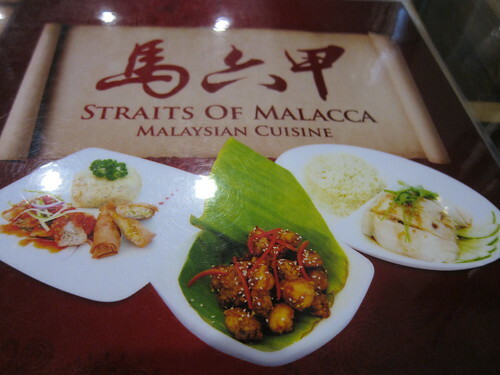 Straits of Malacca is a Malaysian eatery on the popular Kingsway, Glen Waverley. I know what you’re thinking. Another Malaysian restaurant? What’s slightly different about Straits of Malacca, if you couldn’t guess from its name is that it offers a variation of Malaysian cuisine from Malacca. There are your standard affair Malaysian dishes like Char Kway Teoh or Curry Laksa but Straits of Malacca offers their own take on these dishes, but some dishes are what you may see in any other Malaysian restaurant. 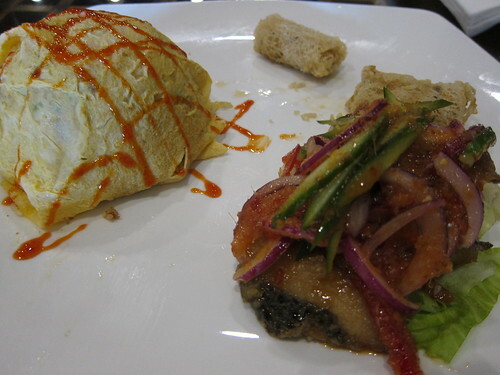 I ordered the Nasi Pattaya with Thai Sauce Fish Fillet and Spring Rolls. If you’ve eaten Petaling Street’s Nasi Pattaya you’ll notice the similarities. 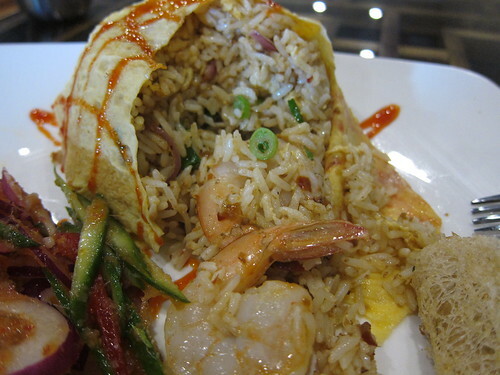 Nasi Pattaya is Seafood Fried Rice wrapped in a paper thin egg crepe and topped off with sweet chilli sauce. Compared with Petaling Street, I found it lacking in flavour. It just didn’t have enough seasoning in the Fried Rice, but I’d still say it’s a pleasant Nasi Pattaya. The real winner of this dish is the Thai Sauce Fish Fillet. If you have tasted Assam Laksa, you’ll instantly be reminded of this taste. It has that superb sweet, sour, salty and spicy combination found in Assam Laksa. The sauce works so well with the salad and fish fillet. My only negative is that the fish is deep fried. I can see why they deep fry dish as it will most likely last longer but I just dislike deep fried fish. The little spring rolls that accompany this dish are quite unique as it isn’t your commonly found spring roll. They have this very light crispy outside and the usual ingredients inside. I’ve actually never had spring rolls like this before, and it was mostly good! 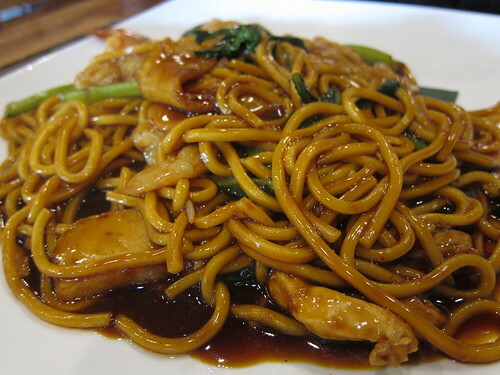 Their Kuala Lumpur style Hokkien Mee reminds me of how delicious my mother’s Hokkien Mee is. I found that the sauce was strong but not too overpowering. I’m not a big fan of fishcake as I find it very artificial, but it is a standard in Hokkien Mee’s I’ve tasted so I can’t really knock it. 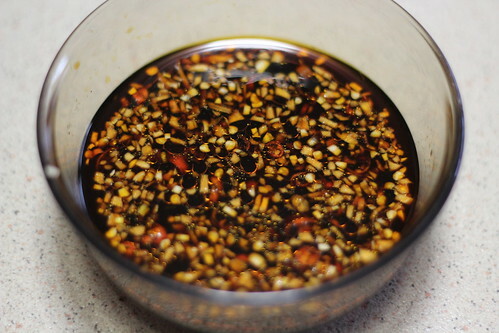 As you can see, the dish is quite shiny, this is the oil that makes the noodles so glossy. Again, another pleasant dish from Straits of Malacca. On their Menu they have a selection of “Fish Banquet’ dishes, I believe this was the Malacca Style Curry Fish with Rice. Again, Straits of Malacca opts for deep fried fish which probably most will like but I find it takes away from the natural fish taste. The curry was interesting as it was a bit sweet and not spicy but I found it tasty nonetheless. You can’t go to Malaysian restaurant and not try their Ice Cendol. I always look out to see if the Cendol (the green jelly) is fresh or not. More often than not, the Cendol is hard, indicating the jelly has been left in the fridge for a couple of days or so. 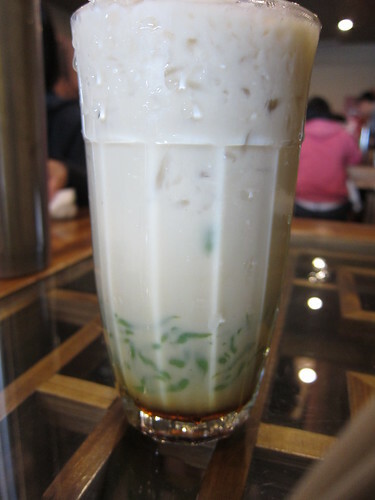 I liked the flavour from the Ice Cendol, the brown sugar syrup and coconut milk were in a perfect mix. Not too sweet, but could have dialled down the sugar just a tad. My only con is that it was served in a glass! I like my Ice Cendol in a bowl so I can share it around. I know many have already decided whether or not they like Straits of Malacca but I really do like that it offers quite a different mix of dishes that you probably are unable to find elsewhere. Some of their dishes are your standard affair but some dishes like their Nasi Pattaya are winners in my book. Straits of Malacca continues to be popular with locals as it constantly fills up during lunch time, and I do have to mention, they do have a number of tables. Basically they bought over the restaurant next to it months ago so its definitely one of the bigger restaurants on Kingsway. I’ve seen they have also have stores in Prahran, Hawthorn and in the CBD but I’m unaware if the food quality is consistent among all locations. Check them out if you’re interested! Using The Crabapple Bakery Cupcake Cookbook by Jennifer Graham again (Buy it here/official website), we decided to do a variation of their Sweetheart cakes minus the icing and shape…. and probably the whole intention of making it actually! Without any of the decorations and grandeur, these cupcakes are basically Vanilla/Almond flavoured cupcakes. Don’t they look all rustic and homely?! Check out the recipe below with how to make the decorations/icing as well for those that want to try it. 3. In a separate bowl, cream the butter for 1-2minutes. Add half the sugar and beat for 2 minutes. Add the rest of the sugar and beat for a further 2 minutes or until light and fluffy. Add the eggs two at a time, beating for 2 minutes after each addition or until mixture is light and fluffy. Add the vanilla and beat until combined. 4. Add a third of the flour to the creamed mixture and beat on low speed until combined. Add half of the yoghurt and beat until combined. Repeat this process. Add the remaining third of the flour and beat until thoroughly combined; do not over-beat as this will toughen the mixture. 5. Spoon mixture into the cake trays, filling each heart just over half full. Bake for 15 minutes or until a fine skewer inserted comes out clean. Leave to cool for about 5 minutes before turning out onto a wire rack to cool for a further 30 minutes before icing. 5. If using regular cupcake papers instead of mini-heart trays, this recipe makes 24 cupcakes. Bake at 160 C for 20-25 minutes or until a skewer inserted comes out clean. 1. Prepare the icing to pouring consistency. Add 2-3 drops rose essence and 3-4 drops pink food colouring during preparation. 2. Place the sweetheart cakes onto a fine wire rack with feet. Pour over most of the icing, so that each cake is completely covered. Add a few more drops of the pink food colouring to the remaining icing to create a mid-pink colour. 3. Using a teaspoon, drizzle the icing over so that it runs down the sides a little. Use an offset palette knife to life the cakes onto a serving plate, then sprinkle with the sugared rose petals. If you’re making these cakes for a man, ice the cakes with Dark Chocolate Ganache and top with chocolate truffles. 1. Simply add a little water at a time to the sifted icing sugar, until you have the required consistency. If you want to use a flavouring essence, add a couple drops to the icing sugar before you add the water. If you want to use colouring, add it before you reach the desired consistency (if you add it at the end it will thin the icing). Use fruit juice or coconut milk instead of water for a flavoured icing. 1. Rinse rose heads under cold water. Gently pat dry. Dip each rose petal into the egg white until just covered. Dip the wet petals into a bowl of fine castor sugar and shake off any excess. Place them on a wire rack to dry for about 1 hour. 1. In a heavy based saucepan, bring the cream to the boil. Place the chocolate into a bowl and pour the boiling cream over. Leave for 1 minute to soften. Use a small spatula to carefully stir the ganache, being careful not to incorporate any air, until you achieve a silky frosting. 2. To use: If you want to achieve a smooth surface, dip cupcakes into the frosting immediately. If you want to achieve a fluffy frosting, let the ganache cool to room temperature and then apply to the cupcake with a small spatula. Do not stir the set ganache too much as it will become dull. We didn’t go through all that shebang as I’m not a big fan of icing as I find it usually sickly sweet. Crazy I know. So what you get here is cupcakes dressed down to look like muffins. They have this rough texture mostly because of the almond meal that isn’t a fine powder. The process of making this is quite simple, it’s like baking any other cupcake. As the cupcake itself it’s quite pleasant, it’s light and has a predominant almond flavour. Which isn’t a bad thing by all means. 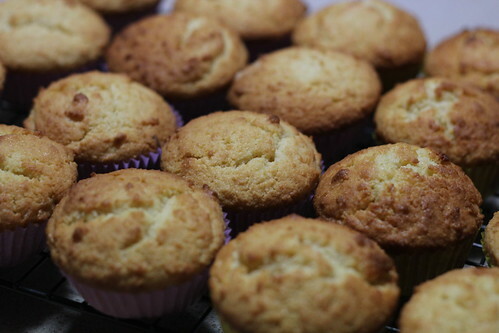 The texture of the cupcake is more grainy because of the almond meal, the yoghurt helps to make it lighter against the richness of the butter so it doesn’t feel like you’re just having a vanilla butter cake. Overall, I think it makes a nice treat that jumps between muffin and cupcake. Loi Loi has become one of my favourite Chinese-Vietnamese eateries on Victoria Street. 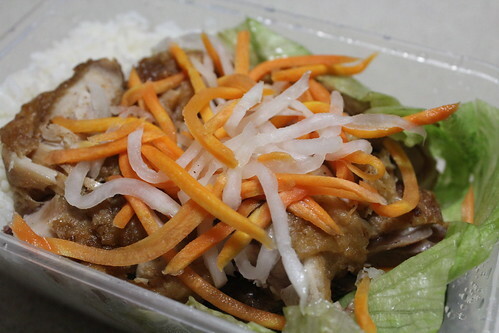 They serve a wide variety of rice, fried noodle, noodle soup dishes and main meals for dinner even with a mix of Asian inspired dishes that probably isn’t authentic but still offerings something different. During lunch time, if you eat in or take away as I did this time, they provide complementary sweet corn soup which is a nice starter or finisher to your meal. Service tends to be pretty snappy too even during peak time, but of course, if the food isn’t good why bother? Luckily, the food in general does make you want to go back again. 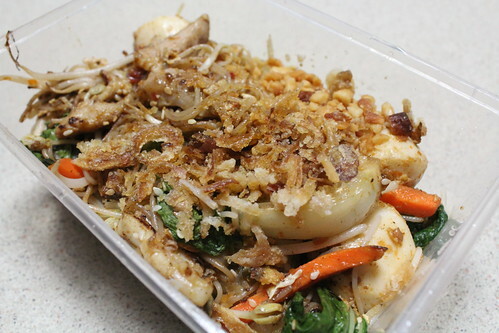 I ordered the Thai Fried Noodles, and it uses the bee hoon noodles stir fried in a sweet, spicy and salty flavour, coating the noodles just gently. The flavour is a departure to what I usually eat, but nonetheless it is a satisfying dish. With the fish balls, prawns as your main protein, it complements the noodles well. The fried dried onions as a garnish definitely add both texture and a toasty flavour to the dish. You also get the pleasant surprise of chopped peanuts which again just come together so beautifully. I really can’t fault the dish, Loi Loi’s dishes are generous in size, but maybe just one criticism is that its a bit oily. If it tasted this good as a take-away dish, I can’t imagine how much better it would have been fresh from the wok. As you would, when you go to a Vietnamese restaurant is to order their Crispy Chicken on Rice. As this was a take-away dish, the chicken wasn’t as crispy, sadly. The chicken was also a tad dry, but with the sweet chilli sauce, it makes a perfect combination. I usually prefer the Crispy Chicken and Tomato Rice but I don’t think Loi Loi has that as an option. This dish doesn’t meet the high standards of some of the Springvale restaurants but I think it’s a decent offering. Probably much better if it was served hot and crispy. 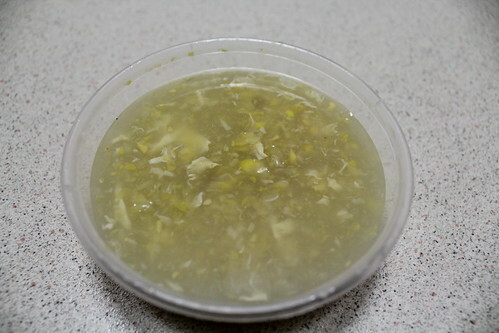 As mentioned before, you get a nice Sweet Corn Soup with your meal if you order for lunch. It doesn’t look as appealing here, but it’s tasty and lives up to its name. You probably can find this in many Chinese Food Court eateries, and it’s pretty much the same everywhere. I don’t think you can make a bad Sweet Corn Soup. All in all, nothing too flashy but it’s lovely of Loi Loi to serve this to customers free of charge. Loi Loi doesn’t stray too far away from its Chinese-Vietnamese roots, but still has a few other South-East Asian dishes for added variety. Food is generally above average, and depending on the dish, can be fantastic. 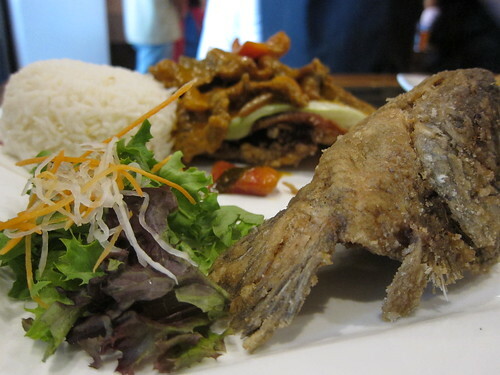 Really, if you’re in Richmond, wanting a good meal, Loi Loi is the place to go.